Share prices increased strongly during 2013, and interest rates remained at a low level owing to the European and U.S. central banks’ monetary policies with their strong focus on stimulus. Long-term interest rates increased but remain at a very low level. The return on Varma’s investments was very good, and solvency continued to strengthen. At year-end the value of Varma’s investments stood at EUR 37.7 (34.4) billion, and their return was at 9.0 (7.7) per cent. As a result of the good return development, Varma’s solvency capital strengthened to 31.6 (28.0) per cent of the technical provisions, providing a strong buffer against any volatility in the capital markets. The result was generated consistently over the course of the year, except for the temporary downswing in share prices and the rise in long-term interest rates in June. The increase in share prices strengthened in the second half of the year. 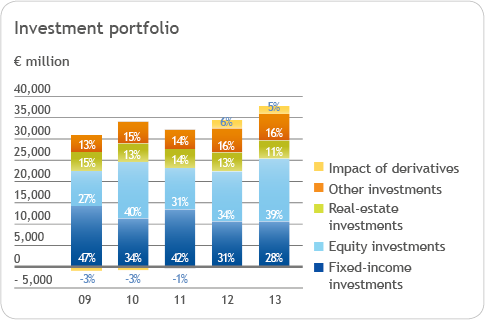 The investment environment was fairly positive for nearly the entire year. Uncertainty relating to the eurozone clearly eased during the year, and for example the interest rates of Spanish and Italian government bonds decreased and their liquidity improved. U.S. economic recovery and expectations of emerging growth in Europe paved the way for a rise in share prices. The sustained low interest rates and the low return expectations on fixed-income investments also supported the equity markets. The development of national economies deviated substantially from that of the capital markets. In Europe and Finland, GDP development was weak, unemployment rates remained high and public debt continued to increase. Finnish companies announced several job cuts and temporary lay-offs during the year, and the investment level remained low. However, the positive trend in share prices reflects investors’ confidence in companies’ future earnings power. Over the year, Varma increased the proportion of its equity investments, lowered the proportion of fixed-income and real estate investments and kept other investments at their previous level. The total return on Varma’s investments was 9.0 (7.7) per cent. Equities generated the strongest return, and fixed-income investments, real estate and other investments also generated a positive return. 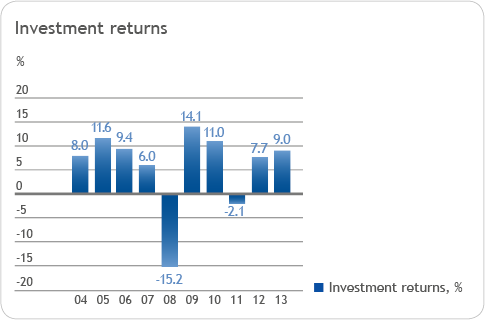 The average 10-year nominal return on investments was 5.6 per cent. The period after the financial crisis has been very good in terms of investments, despite the uncertain economic situation. The average 5-year return increased to 7.8 per cent. When inflation is taken into account, the real return is 5.8 per cent. At 7.4 per cent, equity investments accounted for the majority of the total return of 9.0 per cent on Varma’s investments, while fixed-income investments accounted for 0.4, real estate for 0.4, and other investments for 0.8 per cent. Varma’s investment activities focussed on maintaining the company’s strong solvency and broad diversification of investments, with a strong emphasis on risk management. The company also uses derivatives for investment risk management, mainly for hedging and controlling the portfolio risk level. Varma has US-dollar-denominated investments in hedge funds, equities, corporate bonds and private equity funds. In accordance with Varma’s policy, most of the exchange rate risks were hedged. For diversification reasons, a proportion of the currency position was unhedged, which slightly lowered the overall result as the value of the U.S. dollar fell. In terms of operations, foreign currency risks are managed as a single entity, while in the performance indicators the exchange rate result is included in the investment returns of various asset classes. 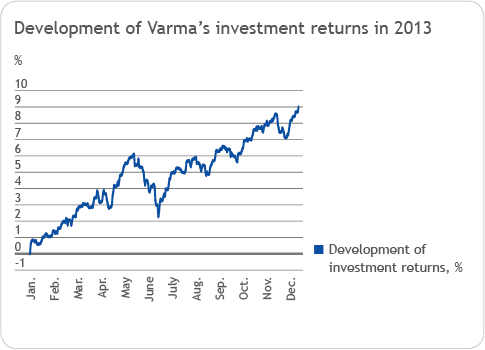 The rise in share prices boosted Varma’s return on investments to a good level in 2013. Our solvency was at a record-high level at the end of the year.